If you look to guitarists playing fast blues licks, you might think to yourself that you will never get these under you fingers. In this article I will prove to you that these powerful blasts of speed are quite manageable if you break down the licks and learn to play them step by step. Here is the tablature for the first lick I play in the introduction of the video. NOTE: In the video I play a few variations on this main lick, which you can find in my free How To Play Fast Blues Guitar Licks Guide. While the speed at which this lick is played may seem very fast to you, once you are able to play it note by note you will realise that the techniques required to play this are pretty straightforward. It’s important that you know exactly how to break down this lick step by step, this will simplify how you look at fast licks like this. The reality is that licks like this aren’t all that difficult if you are familiar with the techniques required. Once you understand them, they simply require practice. Let’s take a look at the fretting hand first. We are using the E blues scale to play this lick. This scale is used a lot, since we can use all open strings. If you are unfamiliar with this scale I would recommend studying the tablature in this guide on how to play fast blues licks. As you can see in the video, the fingerings are pretty straightforward, so let’s move to the motions of the picking hand. 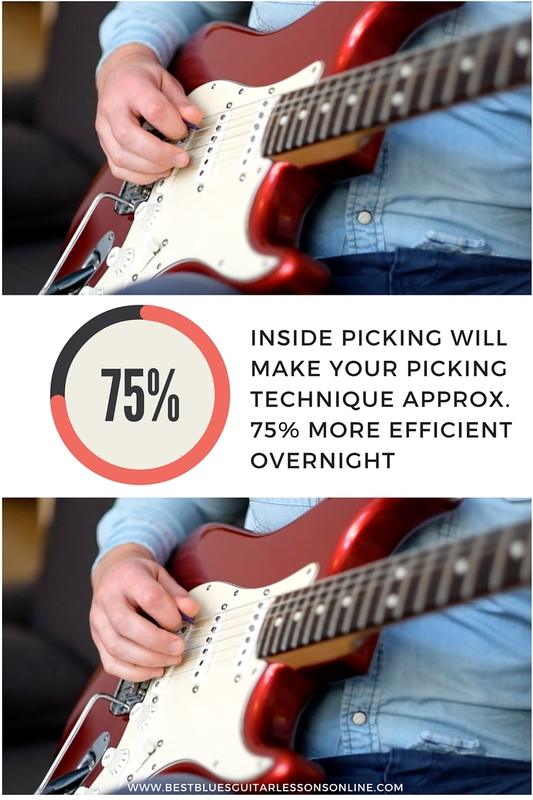 The most efficient picking pattern we can use here is to use inside picking. What makes the use of inside picking so efficient here is that the pick doesn’t need to move all that much. If we were to use alternate picking the pick needs to jump over strings all of the time, but here with inside picking you can clearly see that we don’t need that much motion with the pick. This will allow you to play faster with less effort on one hand and play less mistakes on the other hand. So I would highly recommend you practice this lick with inside picking. Once you have this repetitive lick under your fingers you can start to experiment with some variations. To learn even more about playing fast blues licks, download the free guide on playing fast blues licks on guitar, where you will see the licks written out in tablature and get advice on how to exactly master these licks. Improve your blues lead guitar playing overnight by learning about the best blues guitar soloing lesson.